Your MP4 videos are too large to upload to the web, or store in portable devices? This article shows you the best MP4 compressor on MacOS and guide you how to compress MP4 4K/HD videos on Mac with zero quality loss. Therefore, sometimes you will come across MP4 videos with size that's too large to be uploaded online or stored in mobiles. Well, can you compress MP4 on Mac? In general, the better quality the video means larger size. You can't compress MP4 videos with zero quality loss, but here one of the most sought-after MP4 shrinkers that is capable to dramatically make MP4 video size smaller with the highest quality. 1. It supports HEVC, so you can shrink MP4 video to H.265 at half the size, and also any other formats like MP4 to MOV, M4V, FLV, 3GP, AVI, WebM, RM, etc. 2. It has complete video setting options to adjust the resolutions, bit rate, video codecs, quality etc. to further reduce the video size. 3. Various editing features can trim the video length, remove unwanted parts, to help decrease video size and customize videos. 4. The advanced High Quality Engine and Intel QSV/Nvidia/AMD GPU hardware acceleration tech will resize MP4 files at world's fastest speed (5X faster than others) with highe quality. 5. 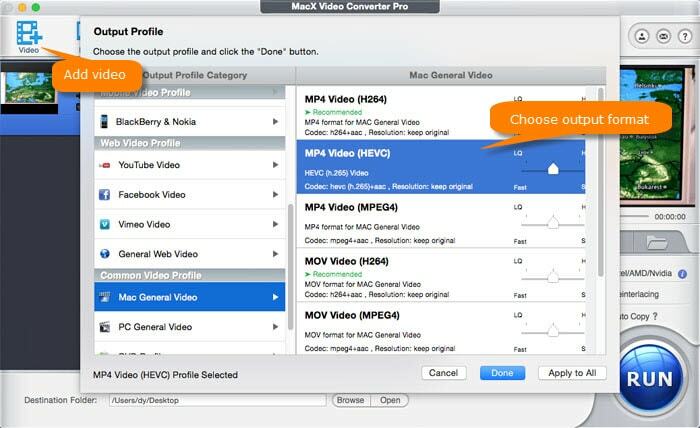 Serving for every Mac/PC user, MacX Video Converter Pro satiates those users' needs to compress MP4 to YouTube, Facebook, Vimeo, etc. supported web video format, video size and video quality. After the top-ranking MP4 video compression software is installed on Mac or PC, launch it and click "Add File" to load the MP4 video files you want to slim down. • WMV - 2.6MB, very good quality. 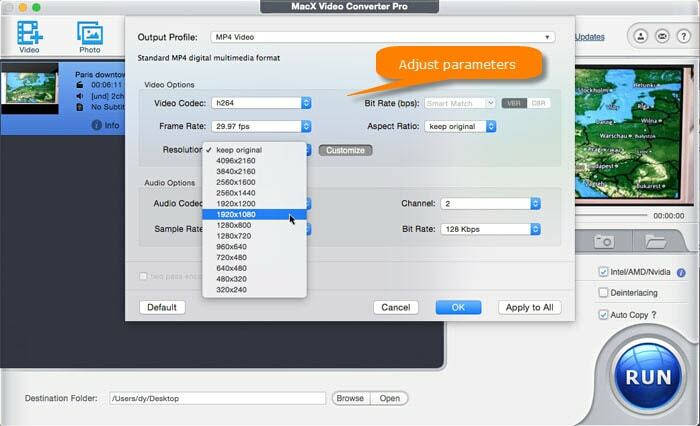 You are also allowed to adjust the video parameters, like Resolution and Bit Rate to make the MP4 video file smaller. Generally, frame rate and frame size don't much affect the file size. Please note that it's proper to tweak resolution (640*480 recommended), and lower the bit rate 20-50% compared with its default one. Normally, the smaller file you want, the lower bit rate you should choose. The video editing features will also help reduce MP4 video size. Click the Edit button with a scissor icon to enter into the editing window. You can trim the video length to remove unnecessary parts from the clip, or cut out unwanted black bars or scenes to further shrink the MP4 video. After finish the above steps, click the "RUN" button to start to compress MP4 files on your Mac. Just a fraction of mins, you can get the downsized MP4 video file with no quality sacrificing. 1. To shrink MP4 files for uploading to online video sharing website, this resizer is especially designed with a thoughtful web video profile, in which you can opt for shrinking MP4 to YouTube, or Facebook, Vimeo and other general video format with optimal file size offered for you. 2. Apart from being such an unparalleled video size converter, it also astonishes you at its reliable ability to download and convert both SD and HD (4K) video from YouTube at a lightning speed meanwhile keeping optimum video quality. Plus, its other features like recording screen video, making photo slideshow video, editing video and more, cause your eyebrows to raise, as well. 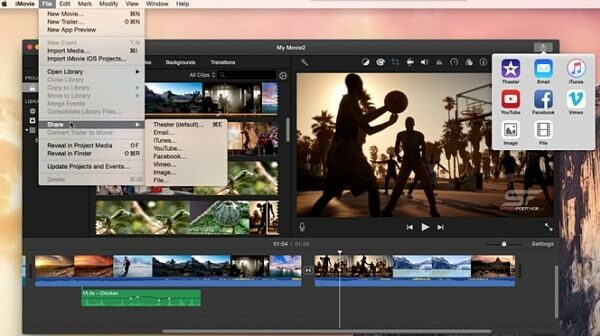 iMovie is the built-in free video editor on every Mac. In addition to editing videos, iMovie will also save footages in different resolutions with different sizes, namely 4k, 1080P, 720P and 540P. To compress a MP4 video on Mac, first, trim and crop the video using iMovie's editing features, then select an output option. Note: with Mac's default MP4 video compressor, you cannot control the output freely. You're limited to the few available options only. Handbrake serves as a free MP4 compressor for Mac. You can easily adjust the video codecs, bitrate, quality, audio settings to resize the MP4 video. Besides, there are also functions to crop the video and adjust the size. You're also allowed to compress MP4 H.264 to half-size H.265. Note: Handbrake lets you compress video to H.265, H.264, VP9/8 and MPEG 4/2 only. It won't support other video formats. VideoSmaller is a very convenient online site that offers online MP4 compression service. 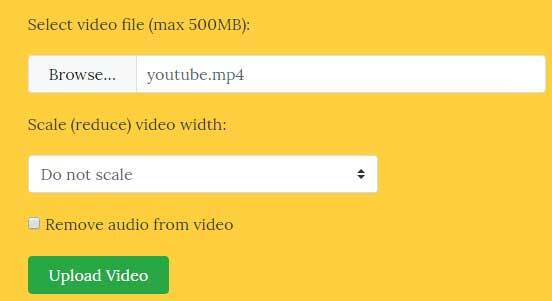 Simply select the video from local computer and click upload, it will automatically compress the video with an output size and compression ratio displaed. Then you just need to download the compressed file. 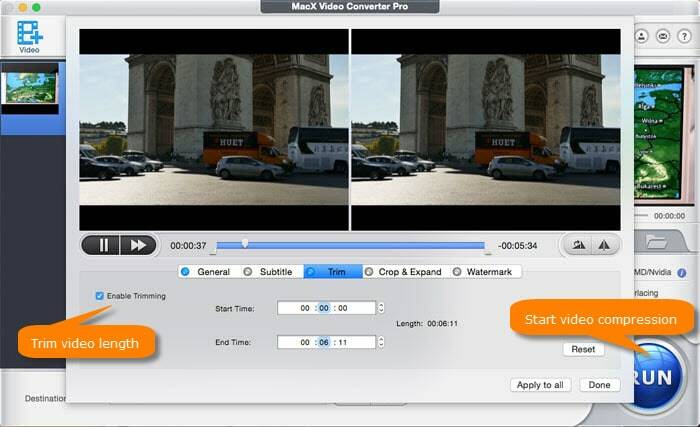 Note: This online MP4 video compressor is extremely useful for compressing a short footage. As you can see, it accepts a maximum of 500MB. And during the compression task, you will have no control on your video. Which is the Best Way to Compress a MP4 Video on Mac? Below we have a small tests on the four MP4 video compressors to show their performances. As for the compression ratio, MacX and Handbrake are the leading runners. And their speeds are quite fast too. iMovie's output sizes are too large to be acceptable when it comes to video compression. Even at its lowest 540P, it's output size are still times larger than the first two Mac Mp4 compression software. VideoSmaller crashese every time I add a 4K video. When I test a 1080P on the site, it gives me a 48.5% compression ratio. Compress MP4 videos on MacOS by up to 90% with ZERO quality loss.